In preparation for the events, we will spotlight the talent of the events each week here on our blog until the series begin. Our first features are Nathania Isnandar and Anthony Mariano and his accompanist Camille Schiess. All will be playing at our shop on April 18th! A native of Indonesia, Nathania Isnandar began playing classical guitar in 2011 at the age of 17. Her primary teachers in Indonesia were Armando Moreno and David Sylvester. In 2012, she moved to the United States to continue her studies at De Anza College with Ron Dunn. In 2014, she transferred to the San Francisco Conservatory of Music where she is currently studying classical guitar with Marc Teicholz. 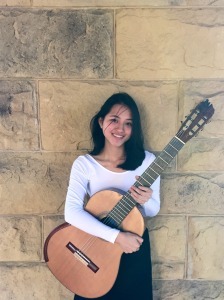 In addition to performing as a soloist, Nathania has performed in numerous chamber groups such as the UCSC guitar orchestra under the director of Mesut Ozgen, the De Anza Guitar Quartet, and is currently a part of the SFCM guitar ensemble under the director of David Tanenbaum. She has also performed in the masterclasses of Denis Azabagic and David Russell. In July 2015, she will participate in the annual masterclass held in Maui, Hawaii by Benjamin Verdery where she will also study with Andrew York. Nathania plays a 2008 double top guitar, built Jim Redgate. Anthony Mariano is a passionate Classical Guitarist who has enjoyed international solo performance opportunities in both Europe and Canada. 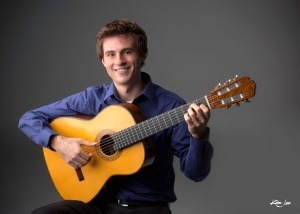 Growing up in New Mexico, Anthony has been recognized as a premiere guitarist in the Albuquerque area, receiving the position of Concertmaster for the second annual New Mexico All-State Guitar Ensemble in 2011. 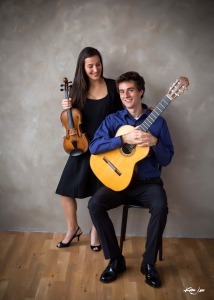 Currently, he studies under David Tanenbaum at the San Francisco Conservatory of Music, and was chosen by the faculty in 2013 to perform in the school’s annual Guitarrada, an event featuring music played on some of the world’s finest historical guitars. Anthony hopes to continue his education at higher levels in order to pursue a career in collegiate music academics.